Faculty, staff or students who currently submit paper timesheets or absence forms will do so electronically after The Upgrade, which is scheduled to launch in April. Paper timesheets and absence forms are being eliminated to bring the University up-to-date with other large organizations and peers. If you do not submit time or absences on paper now, you do not need to change after The Upgrade. Electronic time and absence reporting is for University pay only, and has nothing to do with effort certification related to a grant or contract. The latter is a separate function and will not change. 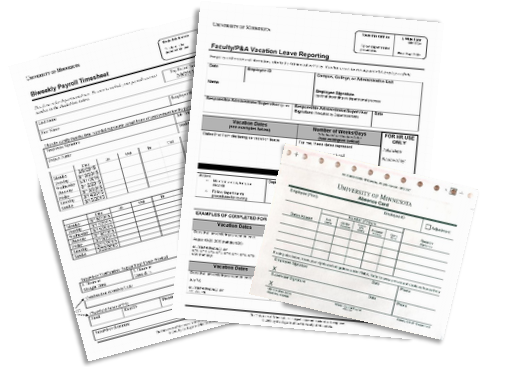 The change to electronic reporting will affect employees in most colleges and units, except those in University Services, Auxiliary Services, the Veterinary Medical Center, University of Minnesota Duluth Facilities and Police, and University of Minnesota Morris Facilities and Police, who will continue using KRONOS, Compass or software other than PeopleSoft to report time and absence. If you have questions after you view the time and absence courses, please see your local Human Resources director.